Michael Dunlop won the Senior TT in June on the Bennetts Suzuki. Michael Dunlop will be gunning for a fourth Southern 100 Solo Championship crown at Billown on the Isle of Man next week. The 15-time TT winner first won the prestigious title in 2011 and sealed back-to-back victories with another triumph at the 4.25-mile circuit near Castletown the following year. Ballymoney man Michael Dunlop celebrates his victory in the Solo Championship race at last year's Southern 100. He was denied a record-equalling three-in-a-row Solo titles in 2013 when Guy Martin lifted the trophy, but Dunlop was back on top again last summer as he claimed the honours in the feature race for the third time. Lincolnshire rider Martin had stated his desire to return to the Southern 100 this year but the Honda Racing rider has been confirmed as a non-starter next week. An official press release issued by the race organisers claimed the ‘Honda was not available with further testing to be carried out’. Martin withdrew from the Senior TT after opting not to ride the new CBR1000RR Fireblade SP2 in the premier race. The 35-year-old was fortunate to escape serious injuries after a high-speed crash in the Superbike race at Doran’s Bend and it remains to be seen whether or not Martin will again line-up for the official Honda team this season, with the Armoy meeting at the end of July and the Ulster Grand Prix still to come – both events where Martin has been a regular in the past. Michael Dunlop dominated the big bike races at the Southern 100 in 2016 with a four-timer. Bennetts Suzuki rider Dunlop will go into the Southern as a big favourite after the 28-year-old dominated the big bike races in 2016 with a four-timer. 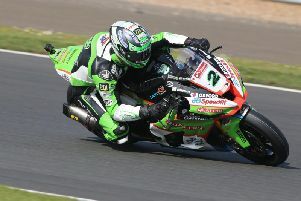 His main opposition includes the in-form Dean Harrison on the Silicone Engineering Kawasaki machines and Manx rider Dan Kneen on the Penz13.com BMW, who clinched a brilliant podium in the Superstock TT last month. William Dunlop is also among the entries along with Ivan Lintin on the Dafabet Devitt RC Express Kawasaki machines, while Daley Mathison is a late entry on his Eddie Stobart BMW. Yorkshireman Jamie Coward will be eager to impress at his sponsor Radcliffe’s Butchers home meeting on his BMW and Honda machinery. Coward sealed his maiden win at Billown in the 1000cc class at the Post TT races and will hope to challenge for the podium. Honda Racing's Guy Martin is a non-starter at the Southern 100. James Cowton lines up for Northern Ireland team McAdoo Racing, while Mullingar’s Derek McGee will make the trip over to the island and could prove to be a dark horse in the Supersport class. Practice and qualifying takes place from Monday, with the first two races getting underway on Tuesday evening. Four races are scheduled on Wednesday before the four-day event climaxes with Championship Day on Thursday, July 13, featuring the Solo and Sidecar Championship races.